So, I’ll be landing in Orlando about noon today, then I’m headed to the Walt Disney World Resort Dolphin hotel. Hopefully, I can grab an early check in. Keep your fingers crossed for me. If not, I have friends already there who will let me stash luggage and smooze with them. The Romance Writers of America National Conference is a week of amazing reconnecting with friends, learning new things, networking with publishing professionals and parties. Fun–if exhausting times! 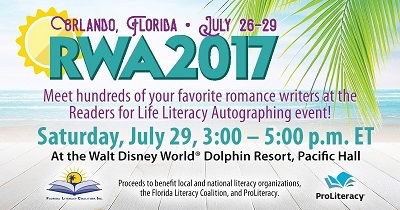 This year, the “finale” is the Literacy for Life signing. If any of you are in the Orlando/Florida area, please come! There will be 400+ amazing romance authors and the proceeds of every book sold goes to literacy programs. RWA has already donated a MILLION DOLLARS and we want to big start on our next million on Saturday! I’ll be checking in on Facebook, Twitter, and Instagram but probably not here. I’ll miss y’all and I’ll be back next Monday–hopefull with some amazing tales to tell. Have a great week and come see me if you are in Florida! This entry was posted in Writing Life and tagged #RWA17, fun stuff, fun travel and adventure, herding cats, inspiration, writing. Bookmark the permalink.